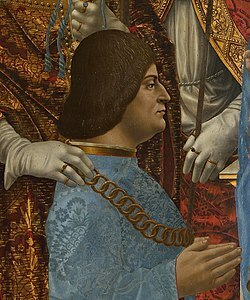 Ludovico Maria Sforza (an aa kent as Ludovico il Moro; 27 Julie 1452 – 27 Mey 1508), wis Duke o Milan frae 1494 till 1499, follaein the daith o his nephew Gian Galeazzo Sforza. ↑ "Il Moro" leeterally means "The Muir", an epithet said tae hae been gien tae Ludovico acause o his dark complexion. Some scholars hae positit that the name Moro came frae Ludovico's coat o airms, which contained the mulberry tree, "mora" in Italian. In modren Italian "moro" is an aa a synonym for "bruno", the masculine equivalent o "brunette" ("mora" in Italian).